The traditional method for making Provola dei Nebrodi, a DOP cheese from Sicily, has been handed down from father to son, and is a laborious process that requires deft strong hands, as well as a dark damp cave. Made only in the cold months from the evening’s milking, the raw cow’s milk is filtered and kept overnight in a very cool place at a temperature of 40°F (4°C). The next morning, the milk is heated to close to 100° F (37° C), and mixed with rennet until it begins to solidify. The mixture is then broken up into small pieces with a special wooden wheel, adding hot water as necessary until the curd is in pieces the size of grains of rice. It is then heated, the whey drained off for ricotta, and the mass placed on a wooden board and covered with a linen sheet. It’s left to ferment in peace for about 24 hours. The fermented cheese is then sliced and worked with a wooden paddle by 2 people, making sure that all the whey has drained off, and then these same expert hands form the thick curds into the traditional pear shape, tying the ends with a piece of jute. The cheeses are salted, and then left in a salt brine for a day, before being hung in a damp dark place for a minimum of 6 months. It is the only Sicilian provola that is aged – all others are eaten fresh. For special occasions, a Provola dei Nebrodi is made with a whole lemon inside, giving a scent of citrus to the cheese. A sort of dairy variation on an Easter egg with a surprise inside. Mild and sweet when young, Provola dei Nebrodi gains a sharp fruity taste as it ages. When it is only slightly aged, it goes well with Bianchi dell’Etna, the white wines from Mt. Etna, while the semi-aged provola goes well with a medium-bodied Nerello Mascalese or Nero d’Avola, both red grapes grown in Sicily. A sharp aged Provola dei Nebrodi is best paired with a dessert wine such as a Passito di Noto, made from the moscato grape. 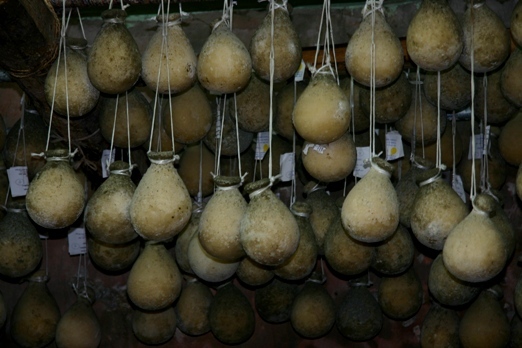 On a recent visit to a cheese aging cellar in Sicily, the dampest part of the cellar was reserved for the aging of the Provola dei Nebrodi – here are the cheeses hanging above the brine vats. I was assured that the greyish film is “good” mold. You can visit a dark damp cheese aging cellar with me on a tour in Sicily– not recommended for the squeamish. I’ve never had cheese that was that interesting from sicily, the cheese I like is a good ricotta or real mozzarella. Hi Maria Lucia – I would love to have you taste the aged Ragusano or other fine cheeses from Sicily, and our ricotta is wonderfully fresh and creamy. Is the Provola cheese available in India? I don’t know, but since it is generally a fresh cheese it may not be. I’m looking for “baked ricotta” or ricotta fornato/al forno. I had it in Sicily last week on Pasta a la Norma. Can’t seem to find it in U.S. or on line. I will try to make it. It’s not as salty as ricotta salata. Thank you. I am planning a trip to Sicily at the beginning of July and would like to visit an artisan cheesemaker. I am collecting material for my twitter (dedicated to cheese only) and for a cheese book. Could you advise me how to go about this. You might try the producer in Giarratana about 20 km from Ragusa, or go to di Pasquale cheese shop on upper Corso Italia in Ragusa and ask there.